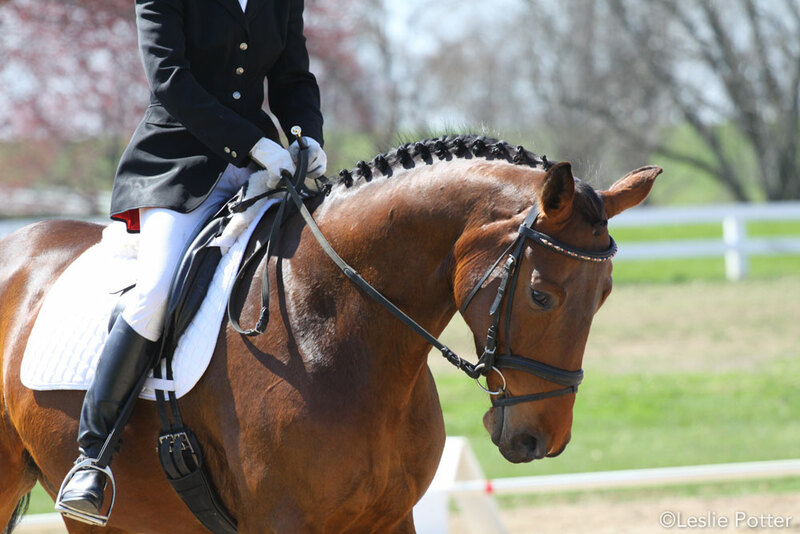 New to dressage shows? Here are some things to keep in mind. You’ve decided to go to a dressage show. Now it’s time to start preparing! Your first step is learning the test. There are also a few other things you can do to prepare yourself to get the best score possible. You will ride your test in either a large (20 meters by 60 meters) or small (20 meters by 40 meters) arena. The size of the ring will be written on your dressage test, so be sure to take a look at the dimensions before show day so that you can practice for the correctly sized arena. Sometimes a dressage arena can feel a lot smaller than you expect, so it is helpful to try riding in one when you are practicing. You can use poles and cones to construct the outline of the arena if you don’t have one already set up. Next, learn the letters around the arena. Knowing where these letters are will help you ride your test accurately with correct geometry. You can make your own dressage letters on milk jugs filled with sand and position them around your arena to help practice your accuracy. Accurate figures are important to focus on. You’ll earn extra points if you make sure to ride all the way to the letter and make your circles the right size and shape. Your test will state how large your circle should be. Look at diagrams of the test so you know where the four points of your circle should touch so that your circle is the correct size. The circle might touch the rail at a letter, between letters or on an invisible letter. Take mental note of these locations before you ride the test. When you’re riding, aim to get to these marks perfectly. The test states what the judge is looking for at each movement. Look at these when you’re learning the test. Pay special attention to follow these directions at each movement to get the best score possible. For example, if the test directs the judge to look for proper bend in a circle, be sure to bend your horse on the arc of the circle. Look to see if any movement or collective mark will be scored as a coefficient. This means that the score you get on this movement will be doubled before your score is added up. Making this movement your best can dramatically improve your score! 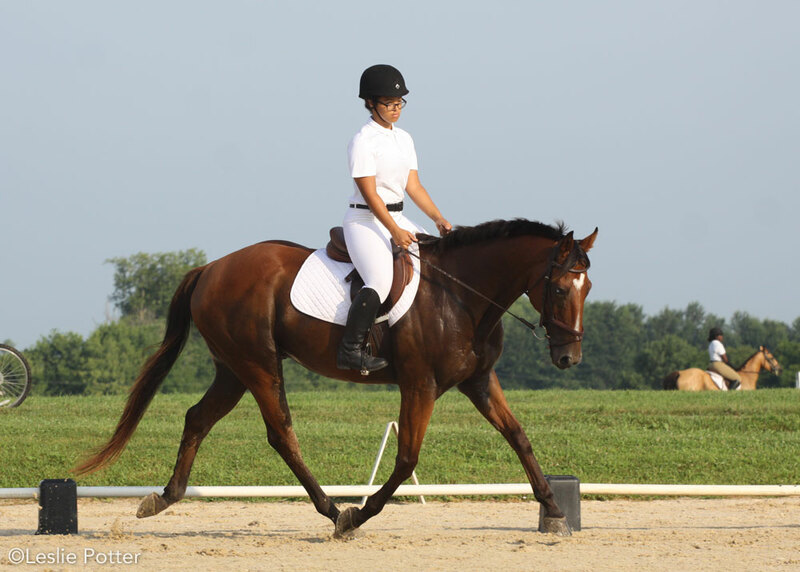 In a dressage test, movements come up faster than you may think. It is easy to get nervous and forget the next movement. Practice the test often. Knowing your test inside out means you can focus on preparing your horse for the next movement instead of trying to remember what comes next. If your horse begins to anticipate the next movement when you’re practicing your test, try walking through the test on foot or drawing it on paper. This way you can learn the test without teaching your horse to anticipate the movements, making them too early. While you’re practicing, think about how you can make each movement better. Are you allowing your horse to cruise around the corner on the forehand, or are you half-halting and setting him up for his next movement? Is his body straight? Are you keeping the rhythm consistent? You want to make sure you are getting the highest score you can at every movement, so you should practice riding your best. Since you’ve practiced so much at home, you know exactly which movement is next. You’ve focused so much on the geometry of the test that you know exactly where everything needs to happen for accuracy. Now, it’s time to focus on your riding. Remember that your horse is likely to be more tense at the show than he is at home. Focusing on your rhythm can help him relax. Use circles to your advantage. Don’t just steer around the circle, but make sure that you’re riding inside leg to outside hand to establish the bend. Use your corners to half-halt and balance him. After you’ve checked your score, don’t forget to pick up the test! This can give you valuable information for improving your riding. For example, the judge may have remarked that your horse needed to be more round in a movement. When you’re practicing the test for the next show, practice keeping the roundness through the movement. Don’t be discouraged if the test isn’t as good at the show as it is at home. Remember that the atmosphere at the show will be different. You will be excited and nervous. Your horse may be nervous or distracted by the change of location. 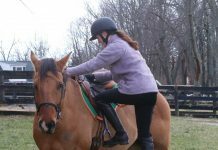 Give him a soft, relaxed, and confident ride, and with time, he will be soft and confident as well.